Just in time for Passover… a new Holocaust movie! It’s hard to believe that 80 years after Hitler hatched his maniacal plan to exterminate Jews, there are compelling stories of faith, survival, heroism and sacrifice still making their way to the big screen. The Zookeeper’s Wife isn’t nearly as gripping and powerful as the likes of Diary of Anne Frank or Schindler’s List, but it’s a valiant effort and comes along at a time when the nation – and the world- can use a good reminder to “never forget” what happened, how it happened, and the dangers of a lunatic leader with a cult following. Not to mention the importance of resistance – and persistence. For that very reason alone, it’s worth checking out The Zookeeper’s Wife, based on the nonfiction book by Diane Ackerman. It recounts how a Polish couple who ran the Warsaw Zoo helped save hundreds of Jews during the German invasion, by using the zoo as a way-station for men, women and children to escape from the ill-fated Warsaw Ghetto. The Zabinskis were able to stay on the property with their son and a few small critters and probably could have turned a blind eye (like so many others) to the human tragedy unfolding in their backyard. But they felt compelled to intervene. They convinced the Third Reich’s newly-appointed chief zoologist, Lutz Heck (Daniel Brühl, Captain America: Civil War) – who happened to lust after Antonina – to let them convert the zoo into a pig farm, ostensibly to feed the German army. The operation provided cover for Jan to make garbage runs into the ghetto and smuggle people out, while Antonina cared for them in secret passageways in their home. Some stayed only briefly. Others, for long stretches of time. The film’s tension comes from the constant fear of discovery and recriminations, as well as Antonina’s precarious position as the object of the creepy Heck’s affections. The film is rated PG-13 so it’s not nearly as brutal to watch as many Holocaust/World War II movies. It’s directed by Niki Caro, best known for the 2002 sleeper hit Whale Rider and 2015’s McFarland, USA, where story trumps action. The Zookeeper’s Wife has a few anguishing scenes, but ends with an emphasis on good triumphing over evil when ordinary people step up and do extraordinary things, at great personal risk, merely because they know it’s the right thing to do. #RESIST. #NeverForget. 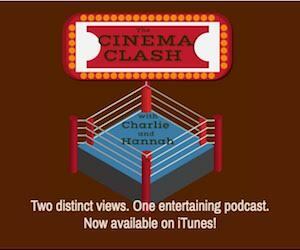 Note: Scroll down below the trailer to listen to the latest Cinema Clash podcast featuring lively debate about The Zookeeper’s Wife and more! On this edition of the Cinema Clash podcast: Charlie and Hannah debate a trio of films designed to appeal to very different audiences – THE ZOOKEEPER’S WIFE, for adults (and older teens); THE BOSS BABY – for kids, and the adults in tow; and AFTER THE STORM, for fans of Japanese arthouse drama. Let the clash begin!